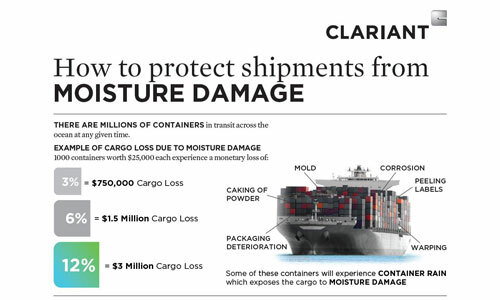 Clariant’s Container Dri® portfolio offers a broad line of container desiccants that offer versatile protection against damaging humidity and moisture during intermodal transport. Available in bags, poles and strips, these industry-leading products absorb up to three times their weight in moisture, and trap it as a thick gel that will not spill or drip. This system is highly effective in preventing the conditions that may cause mildew, warpage, corrosion, caking and other damage to agricultural products, bulk foods, powders, wood products, glass, furniture, automobile parts, leather goods, beans such as cocoa bean, and coffee bean, machinery and metal components. Container Dri II cargo desiccants can help manufacturers, shippers, distributors and other stakeholders protect brand equity, maintain their reputation for quality and safeguard revenues. Container Dri® II is available in several configurations to best accommodate different modes and methods of shipping. The number may vary depending on shipping conditions and the nature of the products being protected. 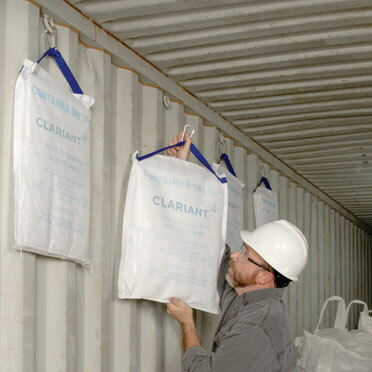 Clariant works with customers to determine the optimal number of bags needed to protect goods for the duration of their journey. It is easy to use and safe to dispose. Container Dri® II individual bags – either with or without adhesive backing. Container Dri® II Strip – adhesive strips for installation onto the walls of shipping containers. Container Dri® II Pole – configured in a hard shell for easy hanging inside shipping containers. Container Dri® II Pack – configured in a hard shell to be hung and suspended high in a container. Container Dri® II Plus – configured with a hook and strap (carabineer) to be hung and suspended high in a container. 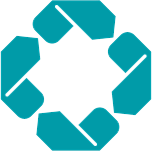 Container dri® II Absorbs up to three times, or more, of its weight in moisture from the air inside the Container during transport and traps the moisture as a thick, no-spill gel. A unique feature of Container Dri II desiccants is dew point control. Dew point is the temperature at which condensation starts to form on surfaces, such as container walls and roofs. 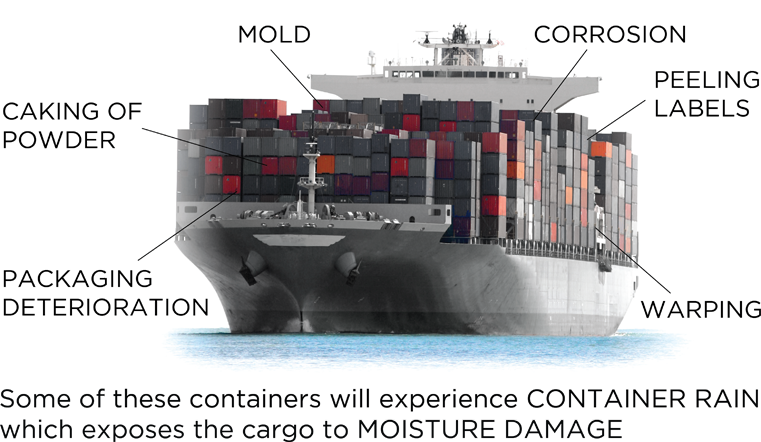 By aggressively removing moisture from ambient air, Container Dri II products lower the dew point to prevent “container rain”, “container sweat”, or also known as “cargo sweat”, from damaging goods in transit. products and solutions. It highlights solutions offering outstanding sustainability advantages and add value to customers and the society as a whole. Our EcoTain® products and solutions are checked against a broad range of requirements that help safeguard the health of people who produce them as well as those who use them. Our EcoTain® products and solutions are evaluated against benchmarks from material sourcing to the reduction of emissions and water consumption. With EcoTain®, we can verify solutions with customized, high-quality advantages and promote integrated sustainable business models that maximize results. Clariant’s EcoTain® label is awarded to products that are identified as best-in-class for sustainability and performance excellence to customers. Products are screened against 36 criteria across three dimensions: social, environment, and economic. Container Dri II delivered a positive benefit in all three, making Container Dri II the only cargo desiccant to carry an eco-label claim.